From Monday to Friday the charm of coins and the exciting history of stamps is on television. Click on the day and time to watch the episodes live streaming broadcast. 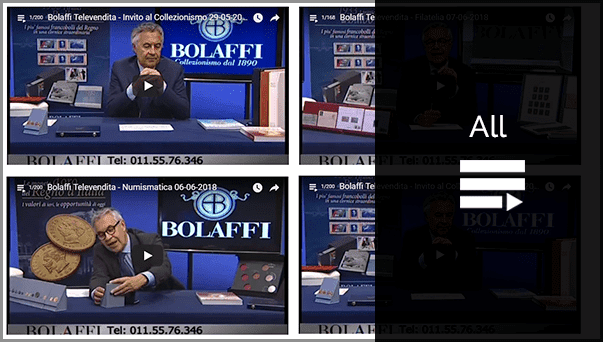 It’s been a long time since Bolaffi inaugurated its first TV sales in 2007. Since then, the experts have broadcast over six thousand hours of insights. Today on Sky channel 825, and DTTV channels 125 and 129 , the daily appointments with collecting are vast; numismatics is broadcast on Monday, Wednesday and Friday, while philately is broadcast on Tuesday and Thursday. The conductors tell the stories behind the stamps and coins, each with their own unique styles: Alessandro Gea is factual, Lorenzo Lamorte engaging, Fabrizio Cavallini witty, and Walter Moy is influencial. Since 2017 the program has been enriched with an important development: taking advantage of the accumulated experience and success, the presenters wanted to please the viewers by creating a tailor-made service for them. Actually, the viewers become the “directors”. It is called TV on-demand and it offers collectors the opportunity to request in-depth information on topics of their specific interest. Do you want to know more about the coins of Vittorio Emanuel II or about the stamps of Balbo’s flights? By contacting the editors you can express your wishes, deciding together the time, the channel and the day of your favorite programme… and sometimes wishes do come true!